I’ve written a detailed, comprehensive book called A Guide to Tarot Card Meanings. But here’s the real news: I’ve released the text of this book into the public domain, so it’s free for anyone to use in any way. You can integrate the content into iOS and Android apps, your own books, or your own classroom materials. 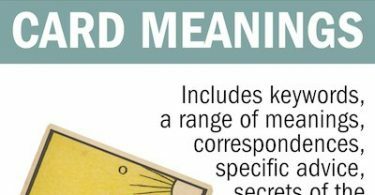 These meanings belong to you — and to everyone — forever. Keywords. Discover evocative keywords for every card. Meanings. Explore a range of meanings, from light to shadow. Correspondences. Links to astrology, numerology, myth, story, and more. Advice. Applications for love, work, personal growth, and more. Symbols. Decode the secret signs embedded in every card in the deck. Insights. Thought questions reveal what a card means for you. Uncopyrighted. Use the entire text in your own books and apps. Illustrated. Scans of a 1904 deck accompany each entry. Comprehensive. More than 300 pages of detailed insights. Tarot teachers, students, seekers, authors, and app developers lacked access to a freely-available, easy-to-read guide to Tarot card meanings. So I wrote A Guide to Tarot Card Meanings and released the text of the book into the public domain. You may use the text freely, without restriction, in any way you wish. 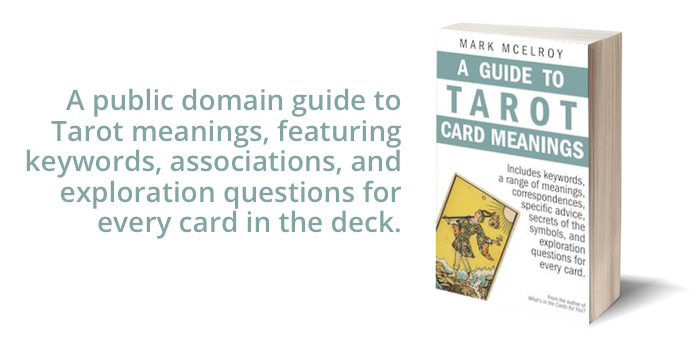 By making clear, comprehensive meanings freely available for every Tarot card, I’m hoping to make Tarot more accessible to more people for years to come. Light: Freeing yourself from limitation. Expressing joy and youthful vigor. Being open-minded. Taking a leap of faith. Attuning yourself to your instincts. Being eager or curious. Exploring your potential. Embracing innovation and change. Shadow: Being gullible and naive. Taking unnecessary risks. Failing to be serious when required. Being silly or distracted. Lacking experience. Failing to honor well-established traditions and limits. Behaving inappropriately. Mythical/Spiritual: Adam before the fall. Christ as a wandering holy madman. Deity wrapped in human flesh. The Holy Spirit. Story: The Main Character as the story begins, unaware of complications to come. Relationships. There’s a reason we say we “fall” in love! Each new romance makes us as giddy as a total beginner. Don’t allow old habits to smother opportunities for growth. You can break rules without resorting to rash action—and you don’t have to be in control all the time. Work. Leap over limits. Don’t waver; now’s the time to jump, even if you don’t have all the facts in hand. Remember that once, every new direction was just another crazy idea. Be prepared, though. Later, your results will determine whether others deem you clever or crazy. Spirituality. You are old and young, wise and inexperienced. Life is a cycle of cycles; find your place in the dance and start dancing. Reinvention is the key to transformation. See who you are, but acknowledge, too, the person you can be. Grace abounds; embrace it. Consider Zen meditation. Personal Growth. Without falling for every scheme that comes your way, you can cultivate an openness to life. What are your limits? What boundaries define you? What might happen if you step outside those definitions? With eyes wide open, expand your world today. Fortune Telling. Watch for new projects and new beginnings. Prepare to take something on faith. Something new comes your way; go for it. When? Unexpectedly, if at all. The Jester. In the royal court, the jester’s wit bought indulgence for his sharp-tongued commentary. As a result, he could say what the king (and others) could not. How might his strategy work for you? The Beggar. While later Fools are fresh-faced characters cavorting on cliffs, earlier incarnations were beggars—the lowliest of the low, according to the Renaissance world view. How capable are you of embracing everyone, regardless of their social status? The Animal Familiar. In different decks, different animals accompany the Fool. In the RWS, we see dog, the symbol of loyalty and instinct. In the Thoth deck, we see an entire menagerie, including a crocodile (the reptilian brain) and a tiger (violent instinct). Which quality suits you best today? The Cliff. The Fool is often shown just one footfall short of a tumble; in other decks, he is suspended in space. In your situation, what works best: your feet on the ground or head in the clouds? Possessions. The RWS Fool carries a bag or wallet, presumably filled with lessons from a previous life. He may carry a white rose (innocence) or a red rose (will). How might your experience, or lack thereof, be the key to your situation? What would I do if I felt free to take a leap? How willing am I to be vulnerable and open? How might past experiences help in this new situation? Free Plain Text. Use this bare-bones format to copy and paste the text into your own work more easily. It’s also a great option for previewing the text before making a purchase. $5.00 PDF. You can download, read, and print the entire book as a beautifully-illustrated, full-color PDF file — a readable on almost every electronic device on the planet. $5.99 Kindle e-Book. Download the entire book and read it on the most popular e-book platform in the world. Includes the full text of the book at an affordable price. $12.99 Paperback. If you’re like me, you love highlighting and underlining your reference books! The print edition is available for Prime shipping on Amazon.com right now. The Text of A Guide to Tarot Card Meanings Belongs to You!